The UN Commission for Social Development serves as a means to advise the Economic and Social Council on matters of social policy and development. The 56th Session of the Commission (CSocD56) was in session from January 29th through February 7th. The priority theme of this year’s Policy Cycle was “strategies for eradicating poverty to achieve sustainable development for all.” The Commission provides opportunities for groups from different sectors to meet and address major gaps that need to be acknowledged in order to stay on track towards achieving the 2030 Agenda – the Sustainable Development Goals (SDGs). 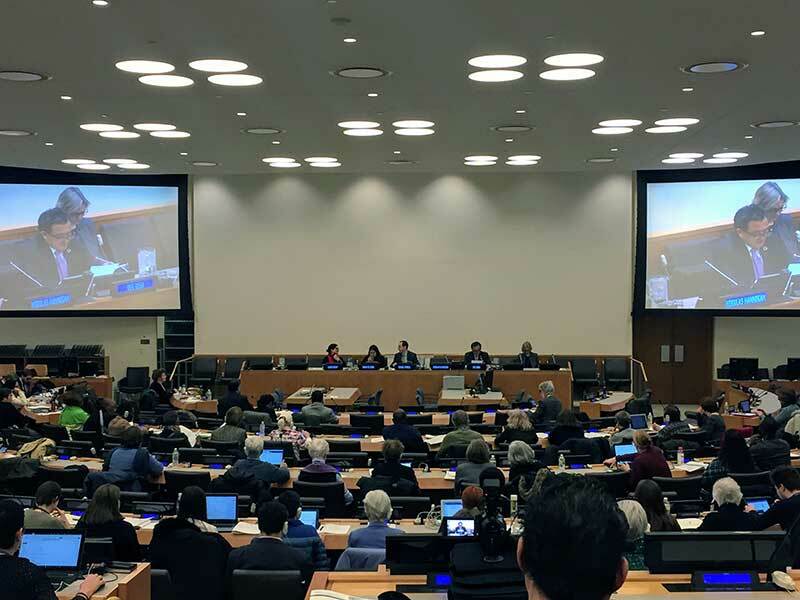 Side events were held all week concentrating on issues pertaining youth employment, homelessness, persons with disabilities, ageism, and other issues related to the SDGs. 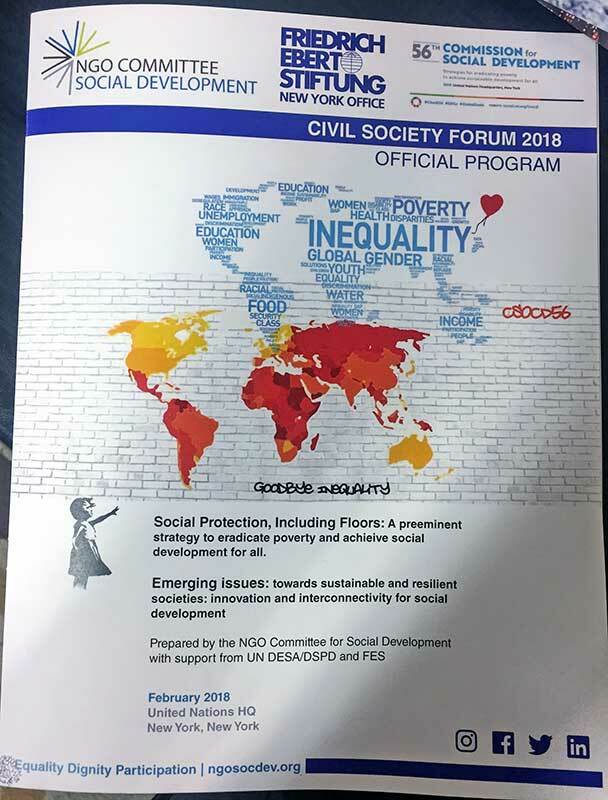 As part of the official program of CSocD56, a Civil Society Forum was held with the theme of “Social Protection, Including Floors: A preeminent strategy to eradicate poverty and achieve sustainable development for all.” The forum is meant to be a comprehensive and cooperative dialogue between member states, civil society groups, and the UN on moving forward with the SDGs. This year, the forum focused on the need for member states to integrate social protection floor policies in their countries. Social protection floors are described as “nationally defined sets of basic social security guarantees that should ensure, as a minimum, that over the life cycle, all in need have access to essential health care and to basic income security which together secure effective access to goods and services defined as necessary at the national level.” The Civil Society Declaration, prepared by the NGO Committee for Social Development, served as a guiding tool for the dialogue. 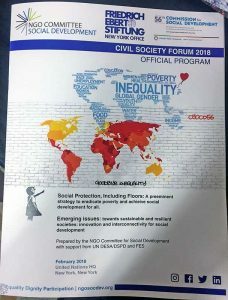 The Declaration highlights the following basic concepts; First, the Declaration emphasizes the importance and absolute necessity for member states to adopt social protection policies as an active strategy in eradicating poverty. Social protection is a fundamental right and not charity. As political, social, and economic landscapes change, threats to human security are a constant. Just as it is the responsibility of governments to protect individuals from external violence, it is also governments responsibility to protect individuals harmed by internal systemic violence as well. Second, there is clear evidence that social protection policies can be achieved and can be successfully implemented with Ireland and Uruguay being two of the most successful examples. The Declaration dispels the notion that social protection would be costly and economically unfeasible. Most countries can in fact afford to create social protection programs in their countries and can ultimately boost their economies in the process. For countries that may find it difficult to bridge the funding gap for social protection policies, the Declaration recalls our shared international commitment towards uplifting and aiding each other. By combining our efforts, we all reap the benefits as an international community. Third, the Declaration stresses the type of long lasting positive impact social protection policies will ultimately have on international and local policy. In countries where social protection programs have been implemented, these protections have not been considered “dependency-fostering hand-outs” but rather are seen as a mechanism to help reshape relationships between civil society, governments, and the private sector. Social protection policies have the potential to undo systemic injustices in our societies and help us deepen our understanding of the social contract we have with one another. 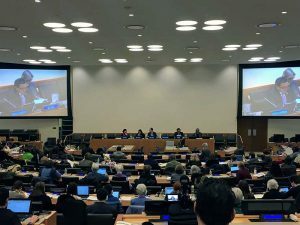 Now that the Commission has ended, non-governmental organizations (NGOs) will continue to advocate for inclusive social protection language and policies in official UN resolutions. I believe we have the power to create new norms in our societies but it is ultimately up to national governments and international agencies to lead the way and follow through on these efforts. Until then, NGO groups like the Dominican Leadership Conference (DLC) will continue to advocate for just policies rooted in our long-standing tradition of advocacy on behalf of human rights. It is a long road ahead, but the opportunity lies in recognizing and identifying the challenges that face us. Former Director-General of the International Labour Organization (ILO), Juan Somavia summed up the feeling best, “. . . the moment you choose to try to change society . . . you have chosen to lead a life of swimming against the current, and the more you are conscious of it, the easier it is to go ahead and do it.” It is a choice that comes to us a result of the harsh realities of life. It is vital to stand up towards injustices and stand with those marginalized because of the flawed system.